Ever wondered why all Juice Plus reps sound the same? Here is the selling guide they give out to all their distributors. you will soon see why they all sound the same but more importantly this will allow you to judge for your self if you think it’s a viable business idea. sharing and mastering Social Media. Don’t sell – the last thing people want to see popping up on their Facebook is ‘selling JP inbox me’ you don’t need to be a sales person, the product sells itself, you need to learn everything about the product, believe in it and share. Sharing how you feel is easy – for example; ‘Woke up again this morning feeling fresh as a daisy, bags of energy and ready to take on the day, I wish someone had introduced me to this years ago!’. You may think it’s cheesy but the indirect approach can just as effective as the direct approach. Talk on the phone – Facebook, email and text as are a great way of drawing interest but the most effective way of getting a client is by talking. So pick up the phone, know what you have to say . Writing bullet points can help you not to forget what you want to say; having a structure to follow can also stop you needlessly waffling on! Remember, the more you know the less you’ll probably have to say. Share links from the JP Website – on your online office under Training, Personal Franchise Manual then chapter 7 there’s a list of links to websites. Sports, Science, etc. Progress photos – Everyone wants to see real results and there are always progress photos on Team Lean, etc. If the picture is someone else’s just ask can you share (People are usually happy to share) Furthermore, it’s important you remind your clients to take before/after pictures. It’s great for them to have a visual of their progression but it’s also great for your juiceplus portfolio as people want to see real results! Tag People – if you tag your clients in your status it has potential to been seen by thousands. Additionally, getting friends and family to share your statuses is an effective way of reaching more people. Ask you clients to do a testimonial and tag you in it, thanking you for introducing you to Juice Plus and sharing their results. social media avenue when there are lot’s out there that can help you generate interest in the product and your business. 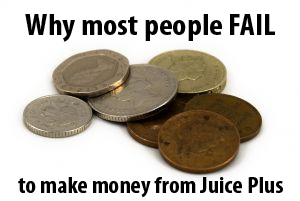 Don’t just rely on social media; you should aim to talk to at least two people a day about juiceplus. Hosting small events at home with a handful of people can also be very productive. Make up a few different shakes and let everyone taste our amazing products. Some people become fearful of being rejected when asking someone do they want to join their juiceplus business and once they’ve been rejected they can often be reluctant to ask anyone else again. A clever way of asking the question without fear of rejection, is to say something like “Do you know anyone who might be interested in earning some great, hasselfree, part time money?” Most of the time the person will say ….ME! If they do say yes then that’s a green light to give a little more information. However, at this point don’t try and give them a speedy unprepared pitch, get their number and organise a meeting so you can effectively explain about our amazing business. Conversely, if they do say no, you can just say “well if you think of anyone, can you pass my number on and ask them to give me a call?” This way you haven’t been rejected! Get together with your team as much as possible, maybe once week/fortnight. Meet for lunch or rotate houses. Share your tips/advise/concerns. Host an event, if your sponsor is at SSC level or above they are entitled to expenses which can be used to help book rooms/print leaflets/promotional materials etc so ask them nicely and get something organised! NSA offer great financial rewards from the outset and it is important that your distributors know the incentives that are available; however,this is a double edged sword and I have seen firsthand that some who don’t make that first bonus become despondent and feel they can’t succeed in the business. Would we allow a plumber who had been learning a few weeks to come and fix our boiler? Or someone who had just started medical school to treat us for illness? I suggest the answer would be no, so in my mind, nobody should feel sorry for themselves after just a few weeks/months learning a new trade. Training month. A clever way to take any pressure of new distributors is that tell them that their first month is a training month. If they hit bonus that’s amazing but if they don’t they need to understand that all is not lost if they continue to work hard and are willing to learn then they will make a success in this business. Remember, you can’t fail in this business…you can only quit! Sponsoring is a commitment so if you’re not ready to commit to someone…DONT SPONSOR THEM! The more effective you are at teaching the less you time will need to spend with someone…freeing you up for the next person. because if you’re not using the product then how you can share your juiceplus story/experiences?! Try not to use the word selling as triggers negative thoughts amongst most people -the word sharing is more appropriate. Always have a list of names of people you are intending to speak to….otherwise you’ll be waiting for someone to knock on your door and ask you about juiceplus and that’s not going to happen! You can achieve everything you want by helping others to grow. Never lose sight of why you are in the business. Creating vision boards are a really useful way of keeping your aspirations at the front of your mind and if you see it….you have a better chance of achieving it! Finally, where do you see yourself in two years time….in exactly the same place or do you want more for you and your family? Lots of people go to university for many years and study long hours every day yet this is no promise of a job at the end of it. In the business, if you apply yourself you can literally build a small fortune in no time….so what are you waiting for? !